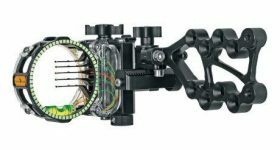 Versatility defines this particular bow sight that provides you with some excellent means to spot your prey at great distances, due to the dual and third axis adjustments available. The pin size can be picked from .010-inch and .019-inch options, so, again, you have leeway that you can’t hope for when selecting many other bow sights on the market. Using only stainless steel and aluminum for its hardware and construction, it is lightweight, and therefore not an issue for your entire bow setup. You should bear in mind that this model tends to be quite noisy, so you should be aware of this and not use it when you are close to animals as they will catch on the sound right away and run. – Being capable of hunting with a bow even when light conditions are less than ideal is a plus, and an advantage this particular bow sight does deliver. The fiber optic pins are ultra-bright, and you will have no issue with seeing them clearly even after dark. What is equally important, you can take advantage of the included rheostat light that can be adjusted so that you can face any environmental conditions without a glitch. Another thing that contributes to the superior visibility offered by this bow sight is the ring that glows in the dark, further improving your overall conditions. – Dealing with accuracy challenges is handled beautifully by the Trophy Ridge React Pro. For starters, it is a great thing that you can adjust windage and elevation without the need for a tool. You only have to loosen the screws that keep the knobs in place a little, and then you can operate micro adjustments by rotating the knobs. The click adjustments mean that you will work with increments, which suggests that you will enjoy mathematical precision each time you’re using this feature. Also, you will find the third axis adjustment to be useful when you need to gain the extra edge on targets that are placed at extreme angles or at long distances from where you are. – The bow sight is built with durability in mind, which is something that should not surprise you too much, seeing that the unit is designed and manufactured by a company with an excellent reputation in making hunting gear of all varieties. The hardware is all made from stainless steel, while the body is entirely from aluminum, to keep corrosion and rust at bay, while still maintaining the bow sight lightweight and easy to use with any setup. Some may argue and say that the polymer encasing provided by the manufacturer to other models is a better option, but that is debatable and you may find this simple configuration a superior pick. 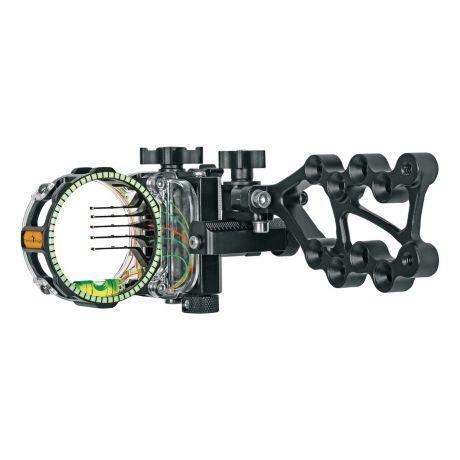 – Using the superior React technology, this bow sight offers quite a feat in terms of adjusting the unit for accuracy. You only need to adjust two pins to provide the accurate yardage needed, and this feature will take care that all the others will fall into place without a glitch. For up to 60 yards, you will have the pins in place to ensure that you will be able to land shot after accurate shot without a glitch. Ease of use is always a good thing for bowhunting equipment, and you will not have to worry at all that your gear will be faulty in adjusting to the conditions that are imposed by the environment. The Trophy Ridge React Pro makes an excellent first impression from the first time you will read the specs. Using the React technology that eliminates all the guessing work from calculating yardage, the bow sight we’re reviewing here is the tool you’ve been waiting for to make your shots become more accurate and successful. Lack of light from the outside world will not be a problem for this model, as it comes with enough features that ensure proper visibility. The pins are made from ultra-bright fiber optics, and the ring glows in the dark. Plus, there is a rheostat light employed that will provide you with the needed extra light for spotting your prey in low light conditions. Available for both left-handed and right-handed users, as well as two pin sizes, it is versatile and an all-around good pick.